No, we didn't wear MultiCam over to the in-laws in hopes of ultimate camouflage from redundant conversation of niceties, but it is great to see our troops celebrating Thanksgiving despite being away from their close family while in Afghanistan. What is downright awesome is seeing a full US Army Band complete with keys and four guitars rocking out for the festivities in their MultiCam Uniforms. 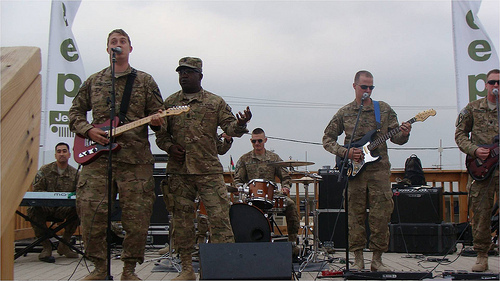 You may be wondering, who is that on Air Guitar, well it seems U.S. Army Command Sgt. Maj. Hill, Senior Enlisted Leader for ISAF and U.S. Forces in Afghanistan is not one to hide in the ranks and enjoy the show complete with his ballistic glasses. He clearly enjoyed himself on and off the stage along with other servicemen and women from many nations during the Thanksgiving festivities that took place at Bagram Airfield.